Volunteers at St. Rita Church in Webster have been preparing and serving fish dinners during Lent for the past 20 years. The $100,000 dollars in proceeds raised during that time have been donated to St. Rita School. Dave Samuelson cooks fish for a Lenten fish dinner at St. Rita Church in Webster March 22. Over the past 20 years, the event has raised $100,000 to benefit St. Rita School. James Samuelson batters fish for the March 22 fish dinner at St. Rita Church in Webster. 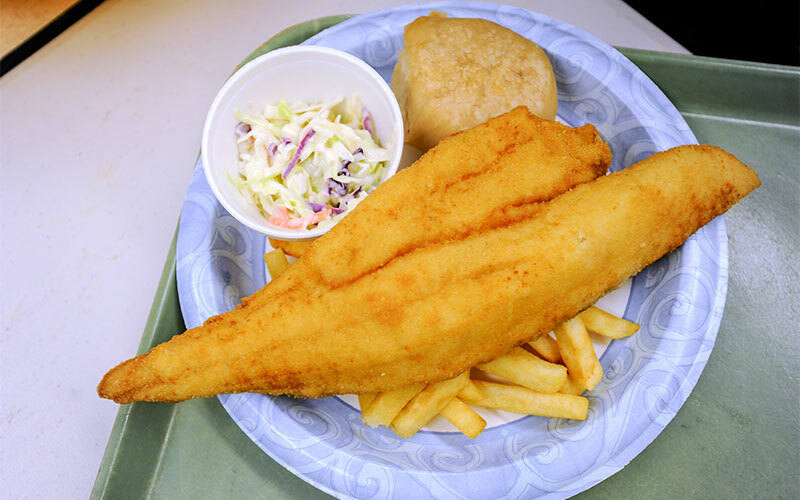 Fish dinners are plated March 22 at St. Rita Church in Webster. Nathan Chamberlain serves food during the St. Rita Church’s fish dinner March 22. The March 22 Lenten fish dinner at St. Rita Church in Webster. Dave Samuelson cooks fish March 22 at St. Rita Church.